Hi Lo Max, FunFair’s fourth game release in as many months, takes the simple but compelling, rapid play, hi-lo genre to a new level, with a variety of features keeping players coming back for more. 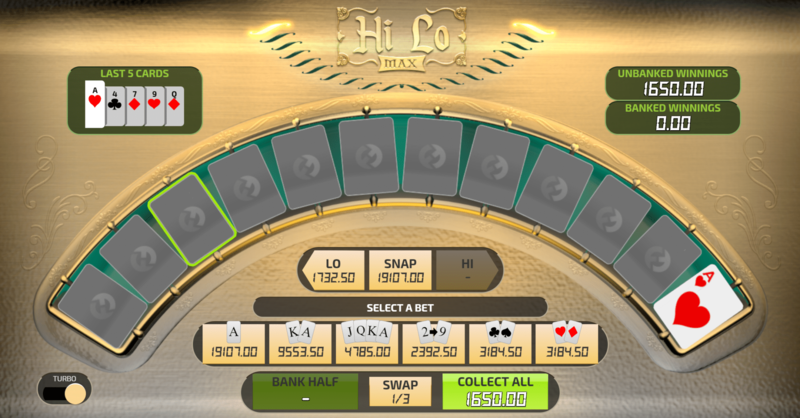 Not merely a case of staking whether the next card is higher or lower, Hi Lo Max takes players on a multi-round journey against the house, offering a number of betting options, swaps and cash-out opportunities to suit their gameplay preferences. With cards revealing themselves one by one on the play table, who knows where the final card will show? Players can risk it all for a big win going for ‘Lo’ on a low card, or take the safe route with a bet on ‘Hi’. For the extra brave, players can be on ‘Snap’, this high pay-out option comes with big risk and rewards if two of the same card show consecutively. As with FunFair’s other titles, extra features come as standard with players able to pick sets of cards, from the high paying Ace to the 50:50 shot on black or red suits. Players can also cash out in-game with ‘Bank Half’ to secure some of their winnings or ‘Collect All’ if they’re happy with their current pot. And, if you back your strategy, why not automate your perfect play with a fully featured Auto Play suite! Geoff Scaplehorn, our Games Producer, said: “Our high quality games production line continues at a pace with the launch of Hi Lo Max, a premium version of the classic hi-lo concept with global appeal. We’re pleased to introduce another game variety to our growing collection and we’re sure its luxury look and feel, easy-to-use interface and engaging premise will prove a big hit with players. Play Hi Lo Max at CasinoFair now!